i million from the budget. of the State of Israel,"
of trade in four to five years. ling in the City of Gold,"
be held on Saturday, Feb.
Id ballroom of the Hyatt. been to Israel several times. f n pages 3 and 5. Israeli expert on the Mideast. A second busload of Eastpolnte women participate ia their own mini-mission. Eastpolnte women enjoy lunch at the Joseph L. Morse Geriatric Center. paign, accompanies the second bus from Royal Palm Beach. Larry Ochstein [kneeling, left] led this Royal Palm Beach mini-mission. entry to the U.S. in March, 1960.
to overlook his previous crimes." alter lunch at the Joseph L.
For more information call Karl Bower, campaign atwciin. at the Federation olflce, 832-2120.
take of his own personal commitment to Federation-UJA fundrabing drives. peeler stressed the importance of Israel as a strategic ally of the United States. cktail reception held prior to his keynote address. phonathon (to be held on Feb.
Century Village. "We are one. herent in our Jewish values,"
cials on the Geneva talks. the USSR who study Hebrew. at the Hyatt Hotel, West Palm Beach. ( ) 8:45 A.M. to 11:30 A.M. ( ) 2:45 P.M. to 5:30 P.M.
( ) 10:45 A.M. to 1:30 P.M. ( ) 4:45 P.M. to 7:30 P.M.
( ) 12:45 P.M. to 3:30 P.M. ( ) 6:45 P.M. to 9:30 P.M.
evening with us and hear Mrs.
who strive to reach freedom." priate to the evening's theme. Moishe Stein and Lillian G.
in the Nazi gas chambers. whom only some 180 survived. Vera and her twin sister, Olga. out of the camp normal. perience is too much for her." the Jewish community at large are also involved. portaying Mengele in the film. watched her two eyes disappf"
welfare programs through UJ A pledges. to right] Harold Rose, co-chair of Buttonwood West; Dr.
iriqihc mi number stick on nw. Mail to Guardian llans, Inc.
the field of Jewish education. through the kitchen after all. used to do this all the time." to pay for such happiness. soup is best when the coo! Now, just pause and think. catered to foreign nations . Jewish food was a true genius. I'm only sorry it wasn't I! Schwartz and Dr. Elizabeth S.
Publtx Bakeries open at 8:00 A.M.
5 with host Barbara Gordon Interview with U.S. Sen.
B'nai B'rith Women Menorah board 10 a.m.
and Professional Women's Division Briefing 7 p.m.
p.m. Yiddish Culture Group Cresthaven 1 p.m. Exclusive Kosher Caterer of the Hyatt Palm Beaches. chair, who noted that Mrs.
Honeyed Chicken, Carrot Pudding, and Banana Nut Sponge Cake. face of mass Nazi round-ups. according to a recent analysis. party on Sunday, Jan. 27, 11:30 a.m. at the clubhouse. American Savings Bank, Westgate Century Village. Sam Roskin will present a play, "The Three Sons." each brother to bring a can of food as their admission. Masada Chapter's general meeting will be held on Feb.
12, 6:45 p.m. at the Chase Bank in the Jefferson Mall. presented by Harriette S. Glasner. I-aromme Hotel, or the Tel Aviv Hilton. prices from your area, contact a travel agent or El Al. homes for as long as possible. can't keep." Rabbi Alan R.
ways what it seems to be. with her in nursing homes. Jan. 29 at 12 noon. will be held Saturday, Jan. 26 through Sunday, Jan. 27.
screening T-shirts, a Trivial Pursuit game and much more. please call Terrie at 689-7700. Carry Sale. Now is the time to get a real bargain. through Friday from 10 a.m. to 4 p.m. This could be your year in Jerusalem. :. TO LONDON OR ROME. the entry form and send it in. ficiary will be the Children's Home in Israel. (Dover A 320). Reservation required. An evening at the Musicana is planned for Feb. 12.
sportation and dinner are included. planning seminar on the topic "Economy and the Times." Show on May 17-19, contact JeanetteS. Levine. the American Savings Bank, Century Village. Jewish Hour, will present a program of Jewish music. provided. Sharon Reidy of the Palm Beach Health Dept. announces a regional meeting to be held on Friday, Jan.
Club Road, West Palm Beach. the Sabra Chapter of Women's League in Lake Worth. regional education chair, Ethel Binder of Margate. musical directress Ruth Hyde will be at the piano. Jews of the Soviet Union." summer. Where enery day Is fantastic. Why Is a Tiny Beach Important? at be saved for Israel. re valuable than real estate. eye, ran north or south of Taba. line. So who can tell where it ran? Israel are as remote as the moon. * very badly treated by them. 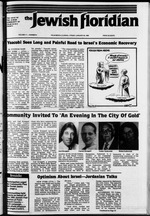 in the justice of Israel's case"
with regard to the Taba dispute. he was in their hands. El Sunday, Feb. 3, at 3 p.m.
about 800 Jews each week. Menu for the week of Jan.
halves and whole wheat bread. take place throughout the day. Conservative/Traditional synagogue in So. Fla.
Usual duties. Must have excellent references. Dade 949-0501. Do not call collect. to invade Jordan, Cohen said. On room only. From 1/1 'til 2/28. jverthe 1983 figure of 350. 1983 to 263 in 1984. New Jersey Gov. Thomas H.
10.9 percent of the 1983 total. 1984 compared to 80 in 1983. Mincha followed by Shotosh Suedoa. 501 N.E. 26 Avenue, Boynton Beach 33436. Phone 586-9428. Rabbi Avrom L. Drazin, Cantor Arthur R. Roeenwaastr. Friday 8:15 p.m., Saturday 9a.m. Beach 33406. Phone 433-5967. Rabbi Dr. Morris Silberman. 1869. Friday night serivcee 8:15 p.m., Saturday, 9 a.m.
P.O. Box 2113. Vero Batch, FL 32981-2113. Rabbi Richard D.
Soloist Susan Weiss. Sabbath servicea, Friday 8 p.m.
Social Hall, 4000 Washington Rd., at Southern Boulevard. will be served in Senter Hall. III will give a book review. for the 1985 year is as follows. Weinstein & Sons, Gratch-Mandel and Hartman-Miller. Monday, Jan. 28 at 12:30 p.m.
various parts of the building. evening services on Jan. 25. Curtla 3 West Palm Beach. Max. 75. of 3800 N. Flagler Drive. Plan Chapel. Weat Palm Beach. Ruth A.. 00. West Palm Beach. Jean. 74. Weat Palm Beach. now. It's a loving thing to do for your family. AIR, well gladly check your tire*!